The Horizon, also known as the luxurious rolling luggage designed by Marc Newson for Louis Vuitton, is quite simply a sight to behold inMonogram Eclipse. Basically the Black/Grey rendition of Monogram Canvas(you would know this if you’ve read the first and second posts of this series), you could say it has come full circle as far the Horizon is concerned. In honour of his late father Louis Vuitton, who started the business making travelling trunks for the crème de la crème of society, Georges Vuitton created and dedicated the Monogram Canvas pattern to him all those years ago. Today, it continues to adorn the luggage pieces of modern travellers, with this being one of them. Only available in size 55 as far as the Horizon in Monogram Eclipse is concerned, it’s only an ultra-light piece of the luggage, the SGD4250luggage measuring some 55 cm by 39 cm by 21 cm is also the ideal carry-on size for most airlines. Framed by a cane handle that tucks away completely when not in use, the larger than normal handle isn’t big just from a design perspective, it also allows for eased manoeuvrability. And with the 4 compact wheels at the bottom, moving from point to point within the airport (even if you’re in hurry and with a full luggage) would be easy. On the inside you’ll find generous compartments that are also flat, which is possible only because the cane handle is positioned at the sides and not in the middle like most other four-wheeled luggages. Finished with a pull zipper closure padlock system that’s also TSA-approved, this is the perfect carry-on for the executive on the go, shuttling from city to city on an almost weekly basis. For this, and more pieces from the Monogram Eclipse collection, you can follow this link to have a look. Better yet, pop into Louis Vuitton boutiques across the island, including ION Orchard, Marina Bay Sands and Ngee Ann City to see how tradition and modernity have combined to culminate in the most beautiful effect. Louis Vuitton has launched an innovative new line of rolling trunks for the 21st century traveler. Imagined by Marc Newson, widely acknowledged as the most influential industrial designer of his generation, the Horizon collection optimizes travel with sophistication and flare. Harking back to the original trunks, Horizon is the first four-wheeled case with a completely flat back shell which allows for optimized space. Every detail from the new line exudes innovation and lightness – from the new discreet TSA-approved lock to the most comfortable wheels ever designed by Louis Vuitton, the new trunks are on the cutting edge of travel. A range of special accessories have been created to pair with the luggage. All items are available at Aventura Mall at the end of September. The trunk comes in three sizes, mini 50 x 35 x 20 cm, cabin 55 x 39 x 21 cm and maxi 68x 46 x 26 cm. The new luggage comes in a variety of prints including: Monogram canvas, Monogram Eclipse, Damier Graphite, Taiga leather and are available in 7 colors all comprised of Epi and in natural cowhide leather. At a later date an entirely laser engraved monogram titanium trunk will be added to the collection. The completely flat back of this Horizon 55 in Monogram Canvas provides for ultimate travel ease while four miniature wheels engineered to be as silent as possible offer 360 degrees of movement. The ultra-slim aluminum 3-digit combination zip-pull lock system is TSC approved and integrated with a single zipper pull, designed to reduce weight and avoid the usual stress points with double zip pulls in luggage. Make a statement with this Horizon 50 in Coquelicot, ideal for shorter trips. Travel in style with this Horizon 55 in Monogram Eclipse, which offers surprisingly large interior capacity for a cabin-friendly bag. Louis Vuitton is launching an innovative new range of rolling trunks for the 21st century traveller, designed by Wallpaper* Power Lister and internationally renowned industrial designer Marc Newson. Its core is moulded as a slim and elastic, shock-proof mesh matrix of self-reinforced polypropylene composite. To achieve the greatest lightness possible, Vuitton’s celebrated Monogram canvas has been slimmed down 50 per cent without compromising its original characteristics. Unlike most rolling trunks, the extendable cane, engineered in lightweight anodised aluminium, has been relocated to the outside, adding structure and strength and removing bulky bumps and ridges from the interior, allowing for more packing space. A new transversal side hinge is built into the structure of the trunk, and the three-digit combination zip-pull lock system – with a single zipper pull – is designed to reduce weight and avoid the usual stress points of double zip pulls. The new trunk comes in three sizes: mini (50 x 35 x 20 cm), cabin (55 x 39 x 21 cm) and maxi (68 x 46 x 26 cm). All three sizes are available in the classic Monogram canvas, Monogram Eclipse, Damier Graphite, Taiga leather and a rainbow of seven colours of Epi leather. Newson and Vuitton worked rigorously to achieve some impressive stats: 36 litre capacity for the cabin size – an increase in internal volume of 13 per cent compared to a similar sized trunk – and a weight of a mere 2.7kg for the mini version and just 3kg for the cabin size. Development took around 18 months, although frequent flier Newson says he's ‘probably spent 20 years designing these things in my head, long before I knew that I was going to be doing this for Louis Vuitton’. To accompany the launch, the French maison will offer shoppers who purchase their cases a 48 hour after-sales repair service in 14 global cities, which will also be integrated into the Louis Vuitton travel app. Louis Vuitton has just launched the “Horizon” collection. Designed and inspired by Marc Newson, widely acknowledged as one of the most influential industrial designers of his generation, Horizon is “Travel In Style” with a 4-wheeled cabin luggage, which offers surprisingly large interior capacity and feather like lightness. Horizon exists in a Cabin size and a mini cabin version; it is available in the famous Louis Vuitton Monogram canvas, Monogram Eclipse, Damier Graphite, Taiga leather, in natural cowhide leather and a rainbow of 7 colours of Epi leather. Marc Newson says “The process of travelling tomorrow could be a little more elegant and a little more seamless and a little more enjoyable. I think the market has a real need for this type of product, both very technical and very sophisticated from a functional point of view. We set to work and we ended up with a result that has no equivalent on the market. Travel is an integral part of my life both for work and pleasure. I have been in the market for new carry-on luggage for quite some time now. We have been using the Tumi line for the last couple of years, but packing and planning, especially for longer trips has been somewhat frustrating with my Tumi suitcases. I will explain why in detail now. Obviously as PurseBop is my life, my laptop is almost always with me. When traveling, easy access to my laptop whether it be for quick removal at TSA or in-flight use is imperative. Now unlike most people that carry a laptop, I choose NOT to physically carry my computer in my hand or personal bag. Illogical…well maybe? But having my laptop in my suitcase makes the most sense for me. I am not leaving home without one of my favorite handbags, and as of late it is either a Birkin or Kelly bag. Since neither my B nor K is going to carry my laptop, it has to go in my carry-on suitcase. My Tumi carry-on does not have an outside pocket, so just imagine my frustration at TSA unzipping the entire suitcase to remove the laptop – or even more of a nightmare, trying to take out the laptop in-flight! Global Entry/TSA pre-check has taken care of all domestic headaches, but I travel extensively internationally, in which case the TSA pre-check benefits no longer apply. The laptop must be removed and placed in a tray for X-Ray. Ideally, my carry-on should have an exterior pocket that can accommodate my laptop and enough interior space for either a quick get away/light weekend trip amount of clothing. If I’m taking a longer trip, my carry-on should have enough interior space for all my additional handbags (of course, I make use of my efficient nesting technique (Read: Bag Nesting – How to Travel with Handbags). Since I never check-in any handbags, they must all fit in my carry-on luggage. Whether I am traveling alone, or with Mr. PurseBop is an important factor that dictates my carry-on contents. If alone, my carry-on must independently meet all my needs. If traveling together with two carry-ons, there’s a little more leeway (which essentially means more space for me, LOL). The search for a set of new carry-on luggage was on the back burner until the release of the new Louis Vuitton rolling luggage launch. You’ll quickly see why these new LV suitcases excited me! Starting from the fashion house’s early days, Louis Vuitton was a malletier that produced custom luggage, like their iconic trunk suitcases, for the aristocrats and nobility among Europe. LV continues to live on as a luggage legend with the introduction of their new Rolling Luggage line by Marc Newson. The Newson Luggage collection is a luxury traveler’s dream come true. Aesthetically, the luggage pieces in this collection are sleeker and more modern than past releases. In terms of functionality though, the New Luggage Collection is by far Louis Vuitton’s most well-designed and well-built set of suitcases to date. Marc Newson is an influential industrial designer who has played a role in creating everything from furniture, household objects, bicycles, cars, and even commercial aircraft. Newson’s breadth of knowledge about object usefulness and practicality is definitely evident in the Rolling Luggage collection. Designing the perfect suitcase can be tricky. With a lot of luggage, the extendable handle is often positioned in a way that obstructs the interior of the suitcase, which means some items can’t lay flat and you aren’t truly using your space in the most efficient way possible. With Newson’s collection, the extendable handle of the suitcase has been relocated to the outside and runs from the bottom to the top of the luggage, which means there are no awkward bumps and ridges in the interior space. This is a 4-wheeled suitcases, which allows for more mobility when walking through the airport. Other new features include a three-digit combination zip-pull TSA lock system, which reduces weight and causes less tension than a double zip system. Newson meticulously designed these suitcases to be user friendly, lightweight, and hassle-free. Available materials include Monogram canvas, Monogram Eclipse, Damier Graphite, Taiga leather, and Epi leather. Interior of the bag is completely flat to maximize space. Extendable Handle located on the exterior of suitcases along the edges of the body from top to bottom. After looking at the pictures of the new suitcases and reading the product descriptions, you can clearly see that there are still no exterior pockets on these suitcases. You may be wondering…wait a minute, PurseBop what’s all the fuss about? Don’t you NEED an exterior pocket? What about your laptop? Well…even with this dilemma, new LV suitcases did manage to join our luggage collection! While considering the louis vuitton monogram bags authentic, it is seen that the stitching is golden. The replica Louis Vuitton handbags does have the brown stitching. The actual LV does not miss any stitches. There are no gaps in the stitching and unfastened threads. It is to recall that Louis Vuitton bags are costly since each detail is perfect. The original LV bags need to be perfect. The louis vuitton handbags authentic come out with the brass and gold metal hardware other than gold painted plastic. 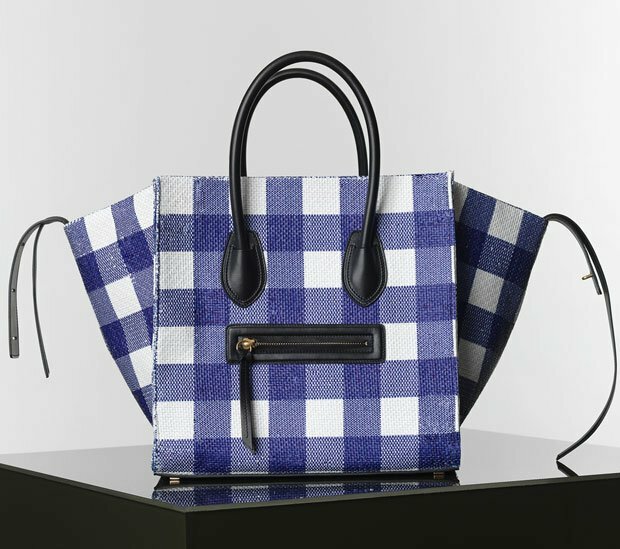 Based on the collection, LV applies a diverse kind of textiles to line the bags. Surprise Louis Vuitton replica (Louis Vuitton) 2015 Spring Monogram V series of bags, Louis Vuitton recently released a number of official Zhang shore shot Lookbook, 2015 spring and summer with a big V’s Monogram and Ramages series of classic bags, belt spring and summer resort style flavor, especially the big V series has brought us no small surprise. Meanwhile blockbusters accompanied proceed package, footwear, eyewear, belts. We know that LV’s Monogram series is long-lasting classic, now it seems more on the basis of the new design is still a classic, and this is a continuation of the classic instinct. Ramages series is quite dynamic, hot Italian summer – add a colorful style. Monogram series bags raid Louis Vuitton 2015 early autumn men’s show, a few days before the early autumn louis vuitton monogram replica men’s show in fact left an ambush, the entire series is a knot pattern, although the main tune, but a lot of Monogram series bags appeared still reached the effect of counter-attack, of course, we also see the large luggage knot pattern unique, we predict knots may become important in the future Louis Vuitton style pattern, combined with the Monogram series of bags will once again become the focus, but be kind changes occur we’ll see. I absolutely adore the Celine Micro Luggage, it came out of nowhere and it rocked the world of fashion. It has everything you might ask from a handbag, it looks great, it has high quality materials and it is enough roomie to carry all your stuff. My best friend, Jane, asked me to buy one of these amazing purses online. So I decided to achieve two of them, one mini for me and one micro for her. The price of the original bags is ~$3000 so we chose the replicas this time too. I contacted my friends from pursevalley and they assured me that these bags are more than beautiful so I placed the order online. In two weeks I received them home and I was very excited to see that they indeed look wonderful. The only difference between them is the dimension the Celine Mini Luggage Bag is: 12” x 12” x 7” (H x W x D) and the Celine Micro Luggage Bag is: 10” x 10” x 6” (H x W x D). But trust me there is enough room in both of them for all the daily stuff; perfect for office and making us look very fun and trendy for the weekends. The leather is sturdy and the Celine Micro Luggage replica bag is able to stand on its own, the stitching are impeccable there are no missing spaces there. The bags have beautiful colors and you can really feel the high quality of the leather when wearing them. They are very easy to wear, with two handles attached and the long strap, in case you need it. The bags have two zipper pockets, a bigger one inside the bag and a smaller one on the front part and they are secured with a large zipper that holds everything inside the bags. The inside of the purse is also made of leather, the same color like the outside. This is not a very common thing but I have to admit I like it. I have to say that this Celine Mini Luggage replica bag is one of the best choices I ever made when it comes to replica handbags. There is no way anybody can tell the difference between these two beautiful replica bags and the genuine ones. They are perfectly replicated and once again my friends from pursevalley did not disappoint me. It’s no secret to anyone that the Celine Luggage Phantom Bag is one of the most beautiful and popular models these days. Countless fashionistas around the world love this design, they all love to wear it with one of their glamorous outfits. It is the perfect day purse for the office or for important meetings. It is stylish and spacious. It is everything you need to lead a modern and edgy lifestyle. This luxury designer bag is also very much loved by movie stars and the magazines are full with photos of divas showing off their fabulous and new Celine Luggage Phantom Bag. One of my favorite versions is the one in light blue. I simply adore the look of this elegant purse. If you also like how the Celine Phantom purse looks like, but you just can’t afford its high price tag then here there are a few tips for finding a perfect replica. The most important detail about this very beautiful bag is the leather. It is manufactured from a very resistant, thick and firm leather. 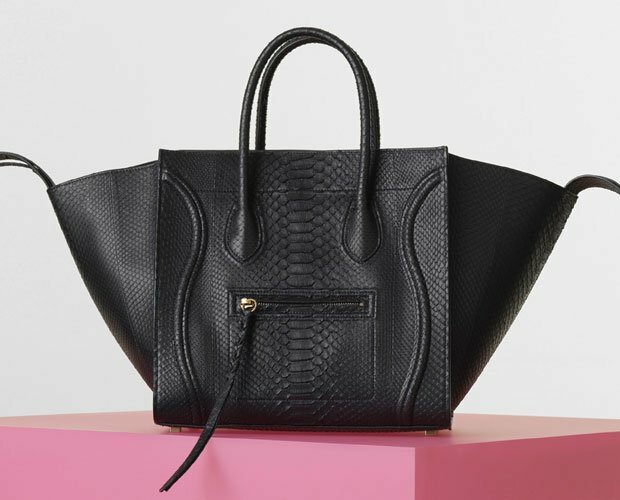 This type of leather looks very refined and highlights the original lines of this bag, every curve and every folding. The original Celine Luggage Phantom Bag doesn’t need to be full in order to stand firm by its own. Even empty it keeps its special shape without bending. A poor replica bag will not have the same high quality leather and because of this it will look cheap and it will bend if its not stuffed. 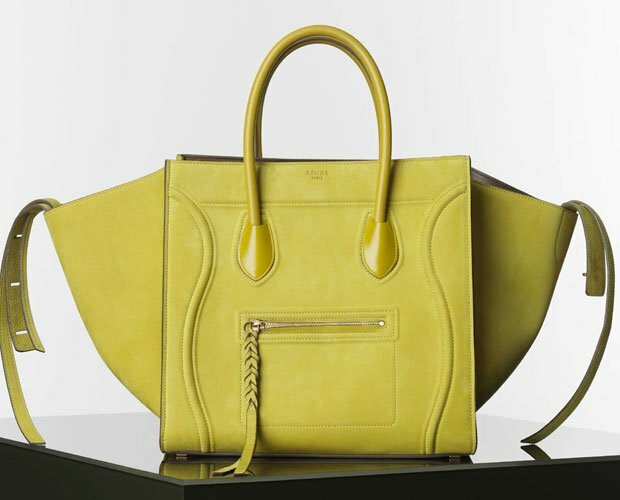 Essential is the color of this Celine Phantom version. This unique blue is very difficult to find on the market of fake bags. Because of this, only a few replica manufacturer will manage to offer this exact color for your Celine Luggage Phantom fake Bag. Beware of lighter or darker shades of blue. These will be a clear giveaway. The handles have a very well constructed shape. These look like tall arches made from the finest leather there is. To ensure the firmes of the handles, these are stitched on the inside part. The stitching offers an extra robustness. The stitching is very important at a Celine Luggage Phantom replica Bag. These are used to outline the curves, the design embelishments and the elegance of the purse. Most decorative stitches are raised and represent the most fascinating part of the bag. Needless to say, each stitch is perfect. There are no symmetric errors, no loose threads or smudges. The hardware has a very rough look. It is silver color and isn’t too shiny. It has a matte finish that looks very modern and city like. I love it. It is a very nice aesthetic detail that enhances the beauty of the bag. Please note that the base must have four rectangular studs made from the same silver metal as the rest of the harware. So just pay attention to all the details of the Celine Luggage Phantom bag you want to purchase and compare every small part of the purse with the original model. It must be an exact match. If you manage to find such a Celine Luggage Phantom replica bag then you can go ahead with your order. The result will be a glamorous and beautiful replica purse. In the world of designer handbags, there is always a reason for everything. The name, the shape, the embellishment, all carries a story or is inspired by something. It’s like the famous artist and his expensive paintings. 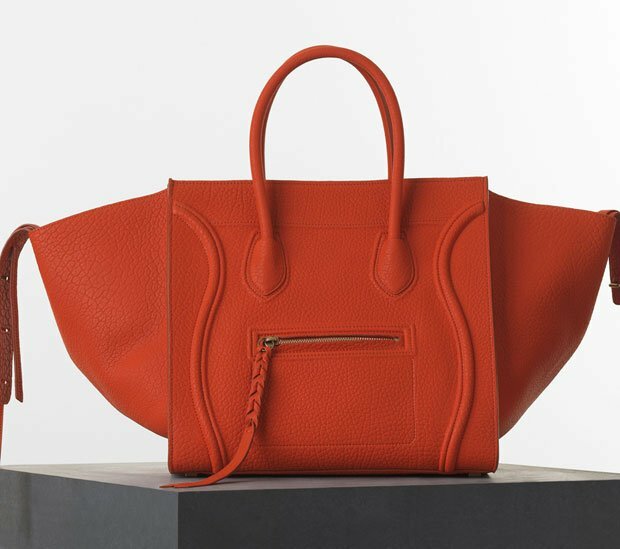 The Celine Luggage Phantom Bag, the name reflects the story of the bag. It’s a fact that the Phantom Bag has been hunted for years. 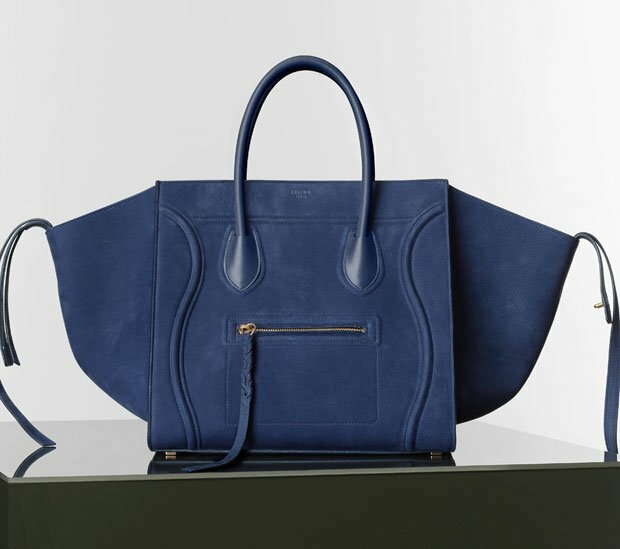 Any serious Celine collector will shop the Trapeze, The Luggage and then move on to the final trophy, the Phantom Bag. On this article, we will share some details about this bag as well as the prices and sizes, the availability of the colors and leathers for the Fall Winter 2014 Collection. If you’re Christmas gift is being delayed, well, you know what to do next. 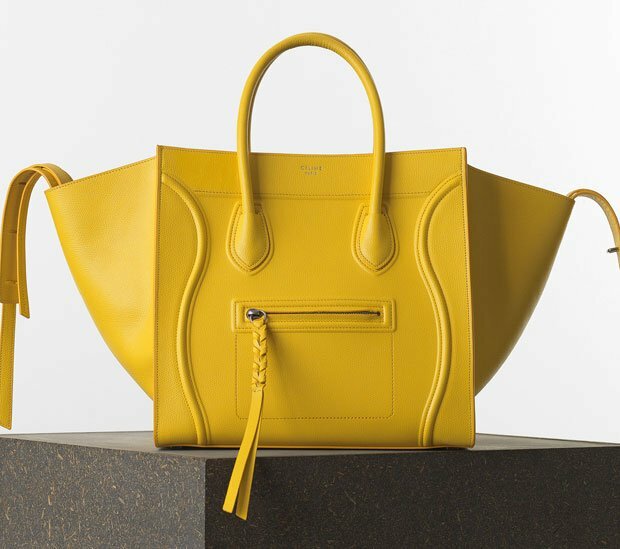 The Celine Luggage Phantom Bag is different than the Luggage Bag. The center part of the Phantom Bag is almost identical to the Luggage Tote, but the Phantom offers more space because of its east and west wings. When we zip the bag up, the shape looks closer to the Luggage Tote, but when you zip down, the size starts to expand. Just like any Celine designs, the Phantom is perfect for casual use and by the way, it’s luxurious. The style is simple and yet distinctive to other designer brands. 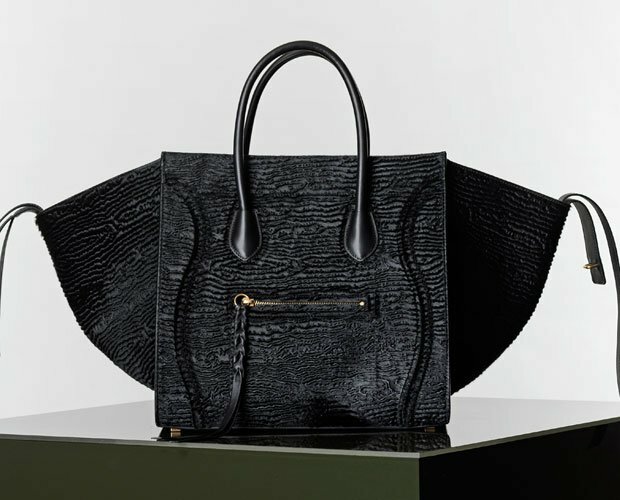 The Celine Phantom Bag brings a large capacity because of its over-sized opening and for the practical use, it has a lot of easy-to-access function. The most interesting and sign of its authenticity is the leather straps on both sides. And actually, it’s not made for decoration purposes, but the leather strap can be buckled together to make the size smaller and chic’er, and also mimic the design of the luggage tote. 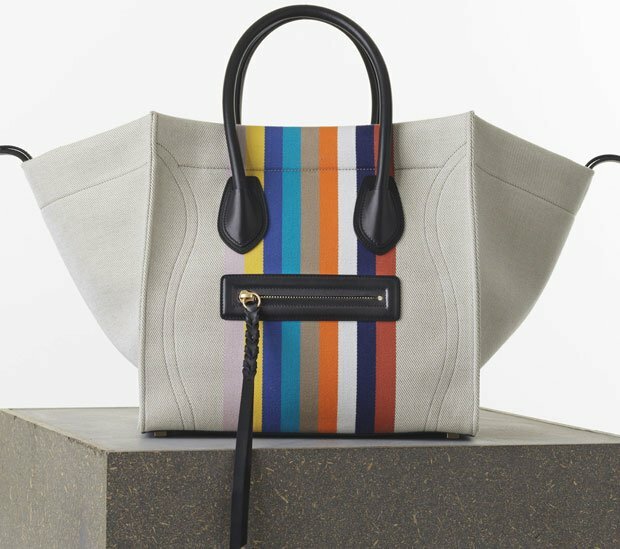 Will We Ever Get Tired Of Celine Luggage Replica? Not When They Look Like This! It seems that the fame and popularity of the Celine Luggage replica bags hasn’t faded at all, since I keep receiving so many questions, photos and reviews of your Celine fake Luggage bags. I completely get and I share your passion for these beauties and I think that the more we practice our real vs fake Celine skills together, the easier it will be for you girls to choose the best replica Celine bags! So here is another Celine replica review of a Mini Luggage that was bought from Bagaholicsonlinebag.com. This was a successful purchase and here is how I can tell! First, here are the email my friend sent me and the photos of her Celine Luggage replica. What a nice Christmas treat! I’m glad that everything went well and that you’re so happy with your bag. As I promised before, here is how I could tell right away that this Celine Luggage replica is good. First, there’s the great quality of the leather. 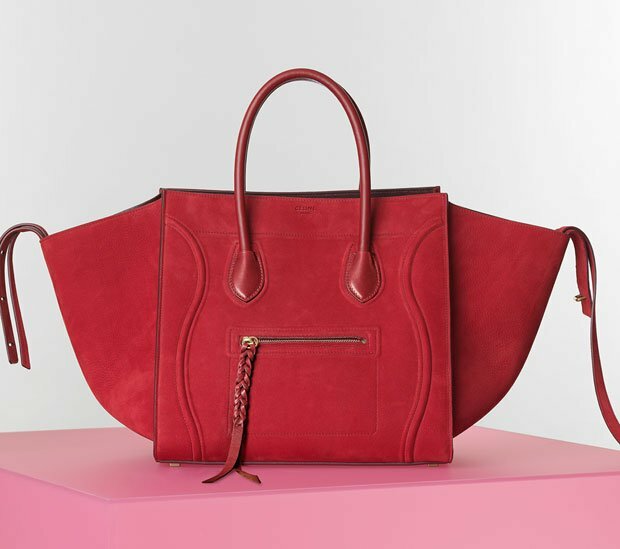 Celine Mini Luggage bags that are made of smooth leather should also have leather lining like this one has. The way the logo is stamped is another sign that this is a good Celine replica Luggage. Just look how clean the imprint looks and how the letters are properly spaced! The serial number is also spot on; remember the pattern I told you about? (one letter followed by two other letters and four numbers). There are a few small flaws to it but luckily they are not obvious enough to ruin its whole look. First, there’s the front zipper. It should be perfectly straight and this one looks a bit crooked. Also, the stitching on the zipper pull and the stitching around the front zipper is not very neat. But even so, I really like this Celine Mini Luggage replica! And the most important thing is that you are excited about it!